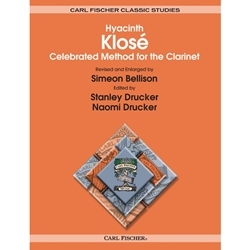 Hyacinth Klose's Celebrated Method for the Clarinet has long been the chosen method for generations of clarinet players. The book was revised and enlarged by Simeon Bellison. Edited by former New York Philharmonic Principal Clarinetist Stanley Drucker and his wife and colleague Naomi Drucker, Professor of Clarinet at Hofstra University, this new spiral bound edition makes an invaluable learning tool even easier to use.